One of three different designs for the base stand. External hub for power and video-in source. No visible connector or socket at the back. It seemed only yesterday when LCD monitors for PCs were bland and unattractive panels that only served basic display purposes. Back then, there really wasn't much to separate one square panel from the other; it was as dull as the beige computing boxes they accompany. Now, however, manufacturers are having to brainstorm harder and design cleverer to capture the attention of consumers. Of greater urgency these days are panel performance and industrial design, and the new L1900 "Fantasy" series of LCD monitors from LG is already looking as if it has all the right checkboxes ticked. The first thing you should know about the series is that it comprises of three different models: the L1900R (Ring), the L1900J (Jar) and the L1900E (Eclipse), with the last alphabet of each model denoting a different design for the base stand. 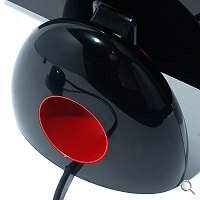 What all three models share in common though is a red and black color scheme and an enamel-like finishing, making these monitors stand out like pieces of art. However, beneath its glossy and artistic exterior, LG has actually packed in a whole bunch of electronics that exacting users will appreciate. 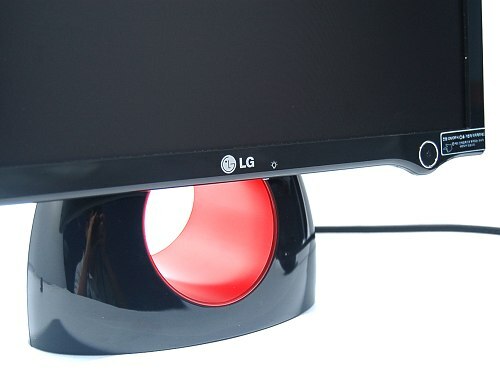 To make life easier for consumers, LG has chosen to install its proprietary Digital Fine Contrast (DFC) technology into its L1900 series of monitors to return a blinding contrast ratio of 2000:1. It also boasts a Flatron f. engine to produce high standards of video performance through a picture-enhancing chip that constantly makes fine adjustments to provide the best possible colors for maximum viewing pleasure. 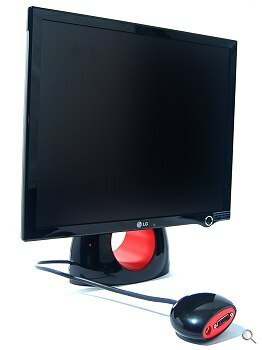 Coupled with a 4ms pixel response time and a color output of 16.7 million colors, the LG L1900 series is easily a monitor that is idea ideal for both work and play. Upon opening the package, one can’t help but notice how slim the product is. 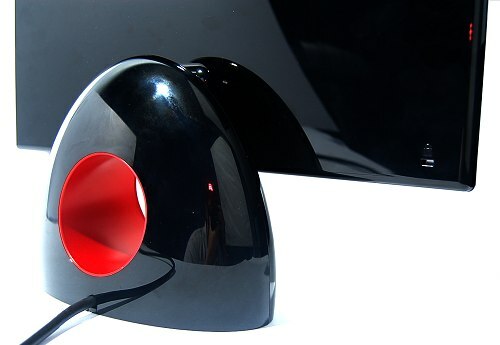 This is achieved by having the power adapter as a separate unit, which was necessary to deliver maximum impression of its artistic form. This also explains why the unit comes with an external power adapter and a hub that's connected to the base stand by means of a 50cm cable. 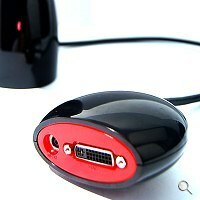 Within the hub is a DC-in jack for power via the external power adapter and a DVI connector. 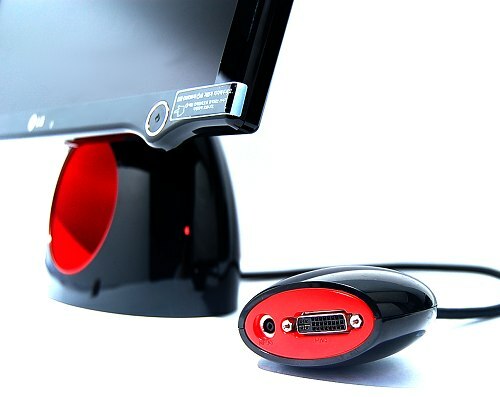 The advantage of such a design is such that users can simply let the hub drop to the back of their desks and subsequently forget about ever having to deal with unsightly power and video cables. LG continues to impress by packing in not one but two DVI cables to accept both analog and digital video sources. 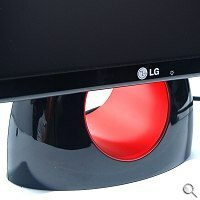 There are only two touch-sensitive buttons up front: a power button and a power indicator button that emits a red light when the monitor is switched on. If and when users need to change other settings such as brightness, contrast, sharpness, color temperature, and other similar features, they'll have to install the bundled Forte Manager program. We put the L1900R to our usual DisplayMate test and the results coincided with our initial deductions as the panel returned impressive contrast and color tracking properties. Games and movies did not exhibit any serious ghosting issues, although banding was noticeable at extreme ends of the panel. Our only problem was that we had to exit games and movies just to make adjustments to brightness and contrast. Nevertheless, the overall color performance was commendable, but not as stunning as we expected it to be. 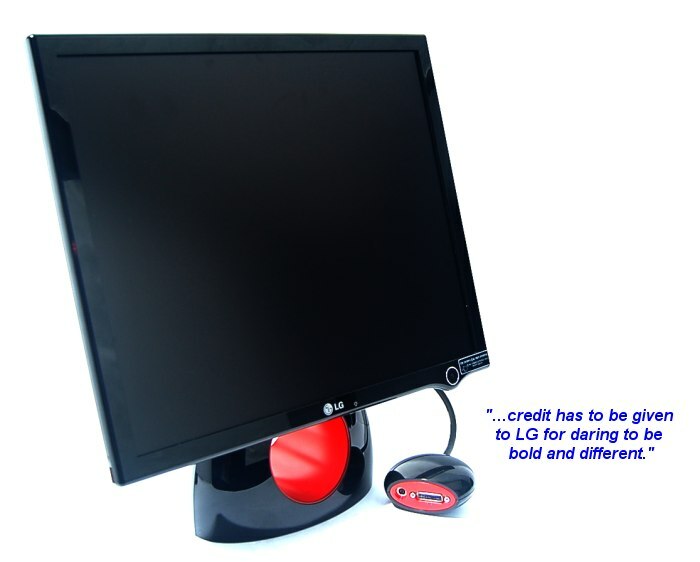 There's no doubt in our mind that the L1900 series of monitors is a refreshing step away from the usual approaches to the design of LCD monitors. Bearing in mind that there are three different designs to choose from and most of our expectations were met, credit has to be given to LG for daring to be bold and different. The beneficiaries are of course consumers and if you've been meaning to jazz up your desktop or study room, then we say you need not look any further.